The Primavera pizza oven is affordable, capable of baking 1 to 2 pizzas at a time and can entertain a family gathering of up to 30 people in under an hour. Elegantly formed and finished it is a work of art, hand crafted in our Salinas, CA facility. Make better pizzas than you can have delivered! The Primavera outdoor pizza oven is Forno Bravo’s most popular fully assembled outdoor pizza oven. It is small enough to fit in almost any outdoor kitchen. Plus it is easy to install, so you can take it with you when you move. 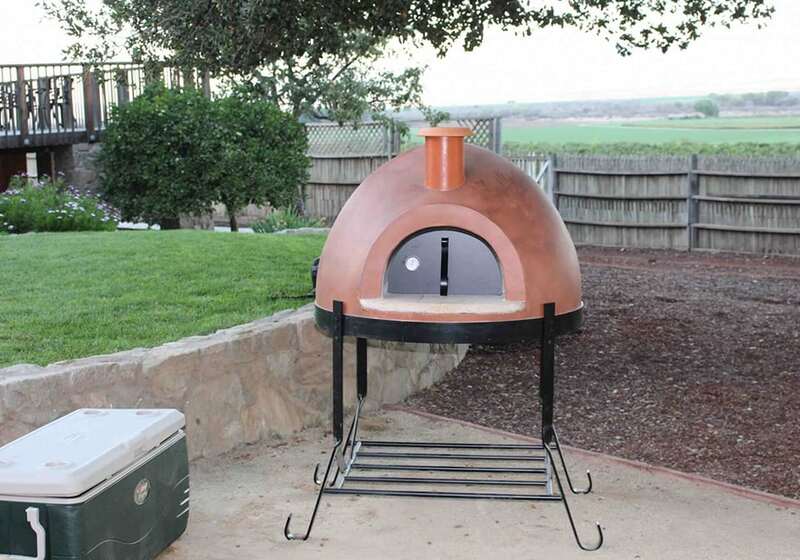 An affordable pizza oven that will last a lifetime. Made from the Giardino outdoor pizza oven kit, the Primavera provides the industry’s fastest heat-up times (20 minutes) and excellent heat retention. This makes it easy to cook authentic wood fired pizzas in under 2 minutes. The Primavera comes in a beautiful hand crafted stucco igloo shape, available as counter top pizza oven or complete with decorative metal stand. If you follow Pizza Quest, this is the oven Peter Reinhart uses at his home. Pre-cure option so you can bake pizza day one! ceramic board floor insulation — eliminating the need for old-fashioned and inefficient vermiculite or Perlite-based insulating concrete. better durability than other small outdoor pizza ovens.